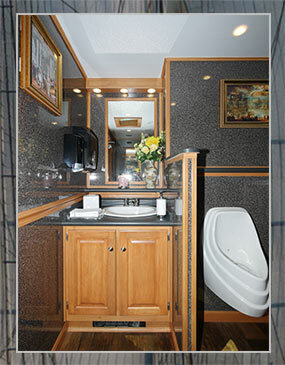 For more information about The NORTH SHORE luxury portable restroom trailer or any of our other restroom trailers, VIP portable toilets, standard portable toilets, portable sinks, porcelain toilet systems for office trailers, guard sheds and ticket booth rentals, holding tanks, fresh water delivery, commercial grade portable sinks, portable hand washing sinks, antibacterial and hand sanitizing dispenser rentals, long-term or short-term portable toilet rentals, long-term or short-term restroom trailer rental, portable shower rentals, and portable storage shed rentals please contact one of our sales specialists at 800-634-2085 or visit our website for details including full photos and videos of all of our unparalleled equipment for any of your portable sanitation needs at www.callahead.com. 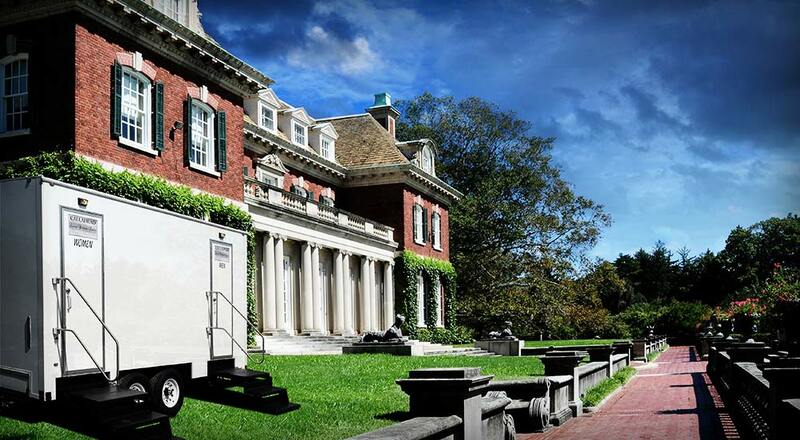 The NORTH SHORE has a white exterior color with outdoor lighting to accommodate any evening event. You enter the restroom using the wide floating staircase with stainless steel hand rails for safety. 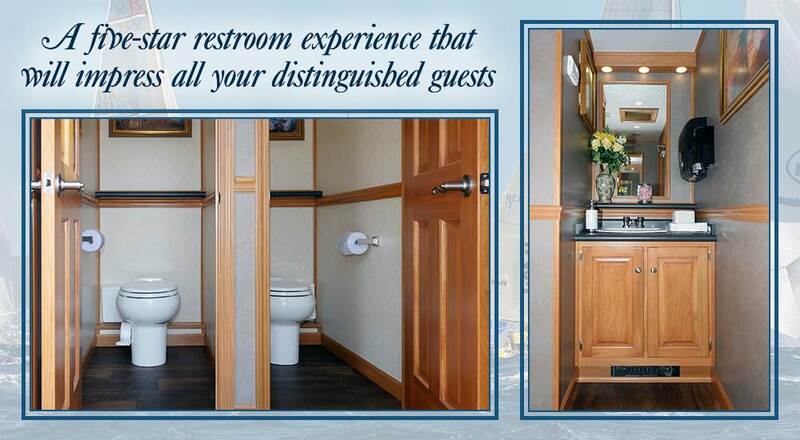 The self-closing entry doors display “CALLAHEAD Luxury Restroom Trailers” signature signage to represent the best bathroom facilities for your guests. 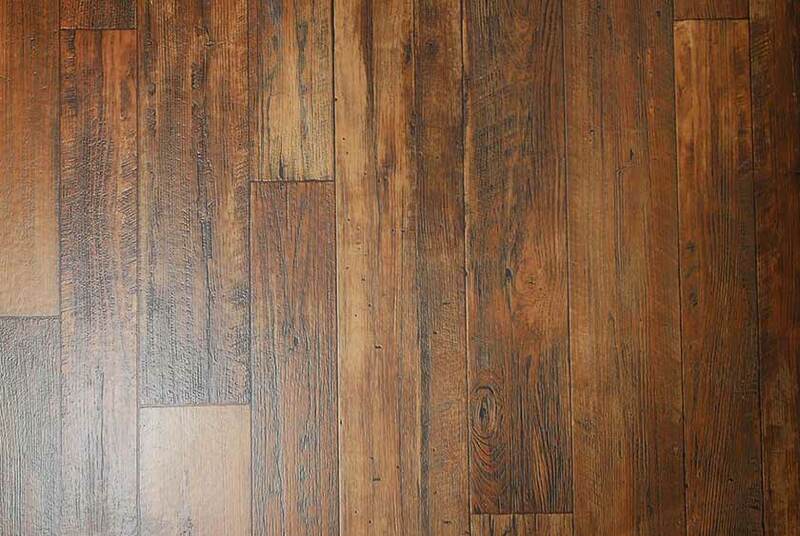 The beautiful wide plank wood Armstrong flooring of the NORTH SHORE adds a warm, rich feel inside the restroom. 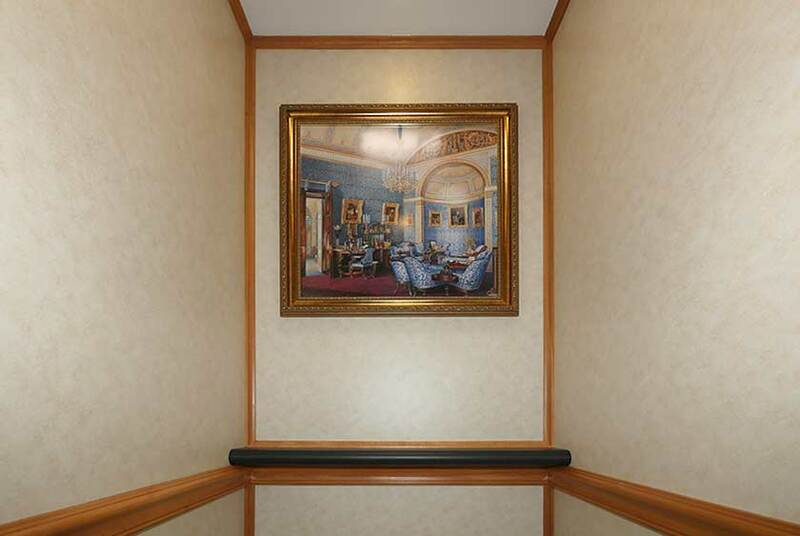 The women’s side has gray faux marble walls with maple wood base moldings, chair rail moldings, and crown moldings. 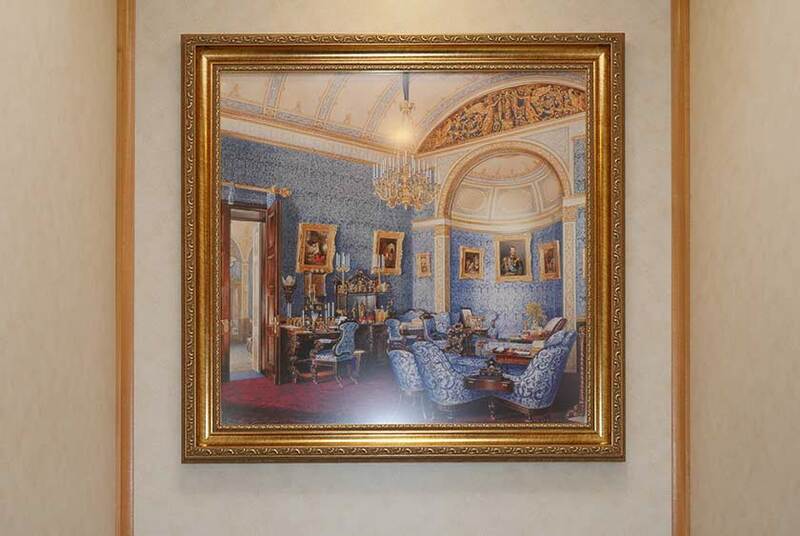 The rich framed artwork brings elegance to the restrooms décor. There are low voltage LED lighting and skylights to provide plenty of natural light inside the restroom. 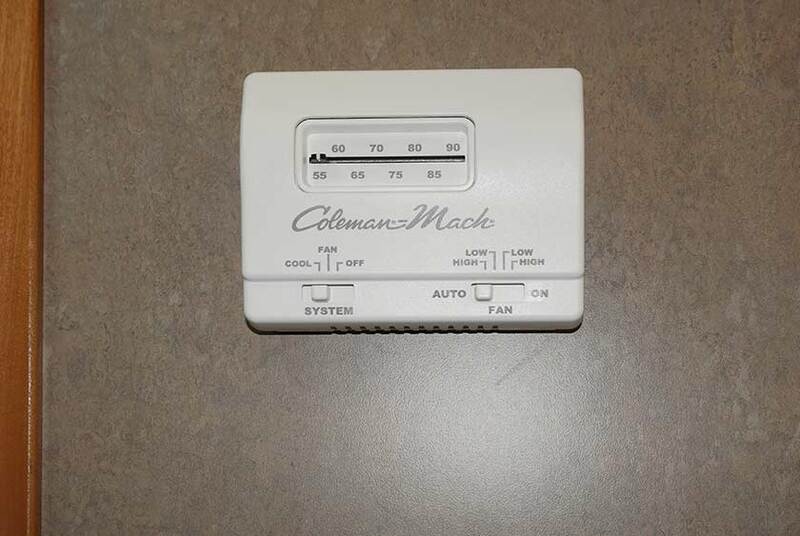 Ceiling vents are also available to offer additional ventilation. The women’s and men’s restrooms each has a vanity sink with a black Corian faux marble countertop and a white ceramic sink basin. 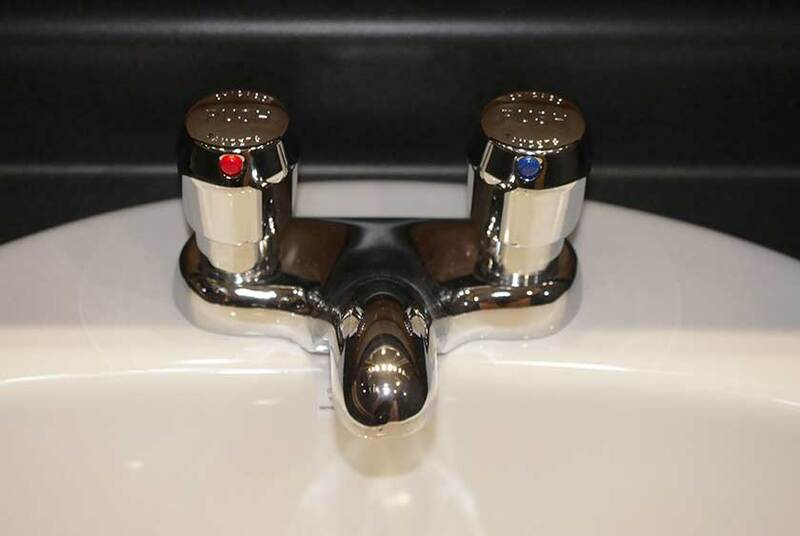 The stainless Moen faucet has an automatic shut off to conserve water use and provides hot and cold running water. 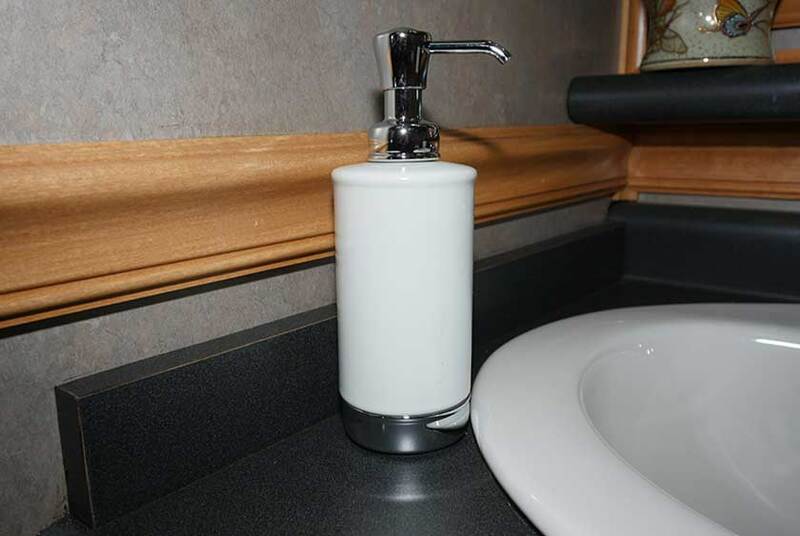 Wall mounted antibacterial soap and paper towel dispensers are conveniently located. Additional luxury amenities include a custom floral arrangement, designer hand towel and soap dispensers, decorative filled tissue holder, and filled candy dish. A trash receptacle is also installed in the vanity countertop for guests to place trash beneath the sink to keep the restroom and sink area clean. 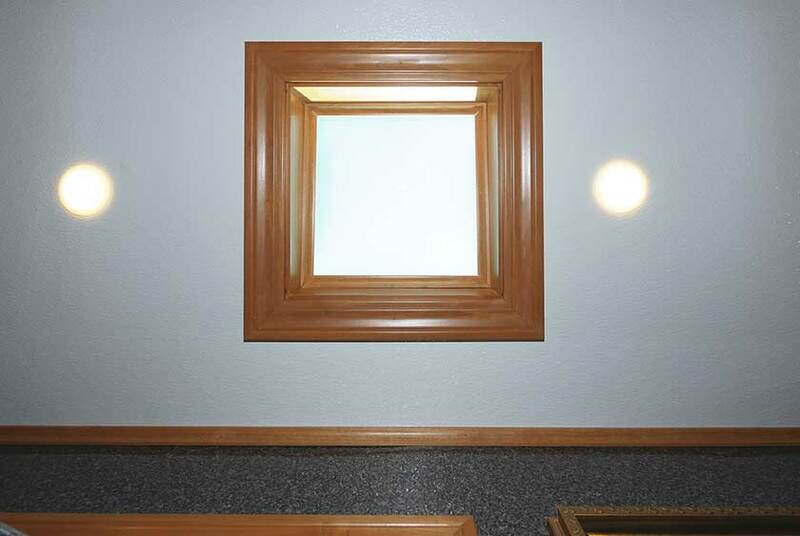 There is a vanity mirror above each sink and a full-length mirror in both restrooms. The women’s restroom has two large bathroom stalls that are fully enclosed for complete privacy. 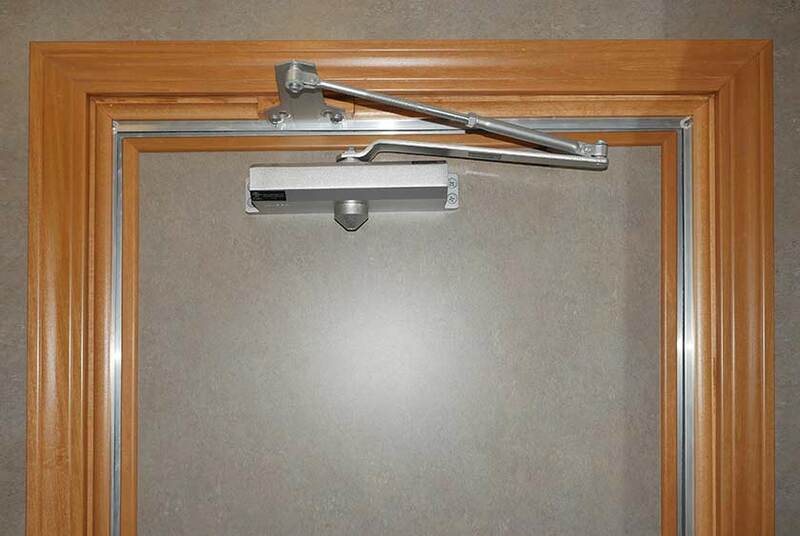 The doors lock on the inside for user comfort and peace of mind. White porcelain spring loaded toilet bowls operate with a pedal flush for hands-free operation. A toilet paper dispenser is in each stall as well as a wall mounted covered trash receptacle that is easily accessible. 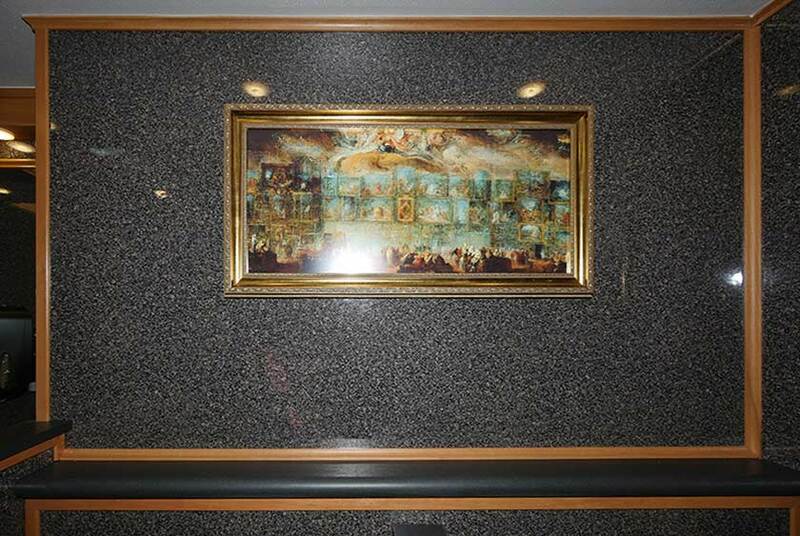 The custom framed art adds a homelike feel to each private bathroom stall. The men’s restroom is just as sophisticated as the women’s side. 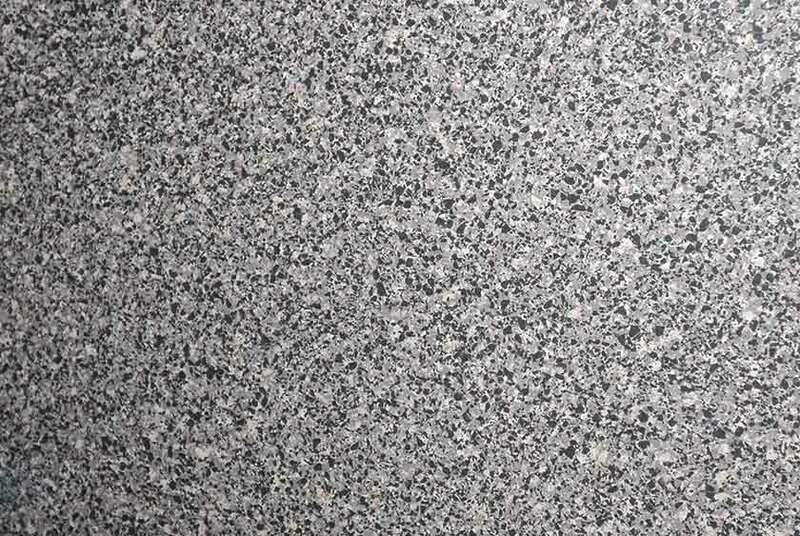 The men’s faux granite walls also include maple wood base moldings, chair rail moldings, and crown moldings. 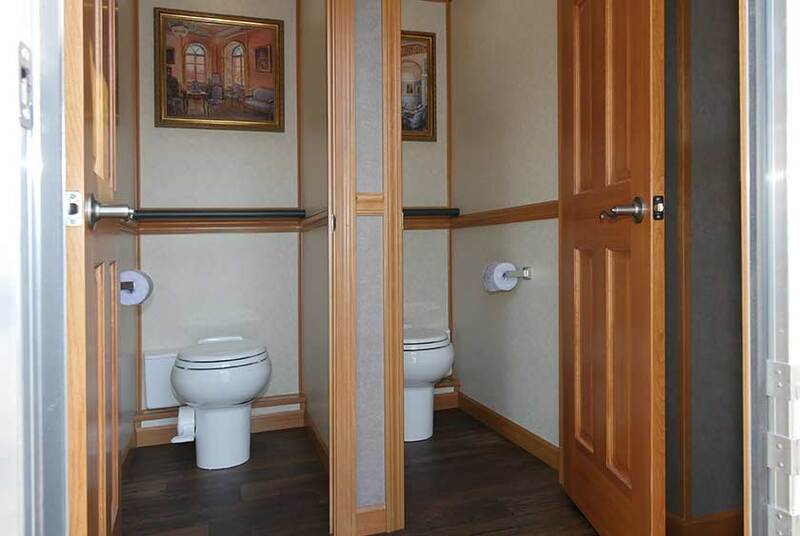 The men have one fully enclosed private bathroom stall with a lockable wood door, flush porcelain toilet, toilet paper dispenser, trash receptacle and framed artwork. The men’s restroom is equipped with two waterless porcelain urinals with a privacy divider. A convenient shelf is also well appointed above the urinals. 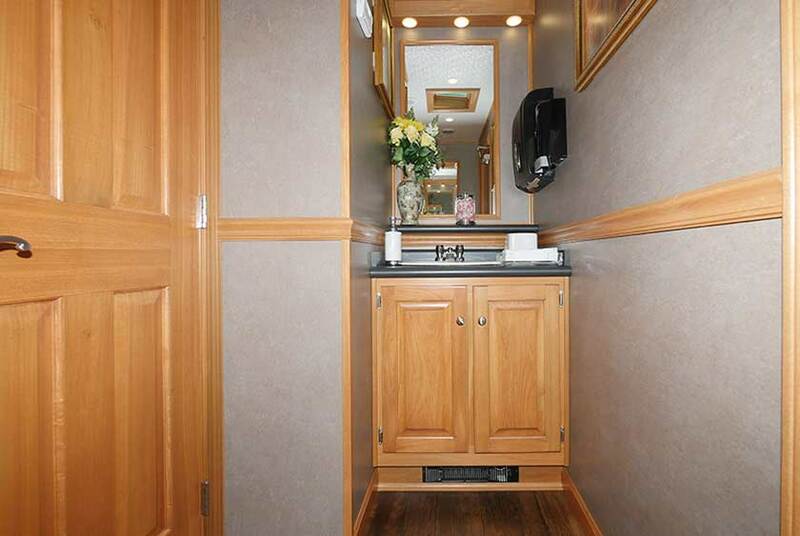 This luxury restroom trailer is completely thermostat controlled with heat and air conditioning system that will keep the NORTH SHORE the perfect temperature any time of year. 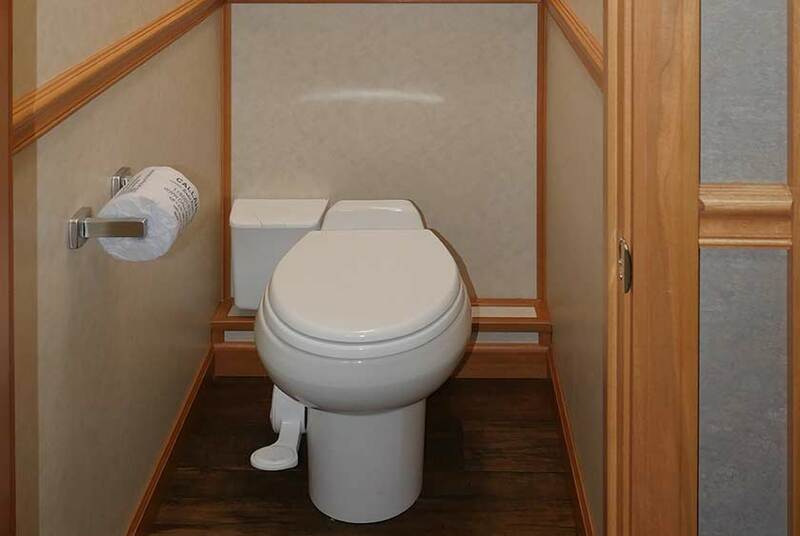 Even during the below freezing temperatures in New York, this restroom trailer will remain comfortable and fully operational. 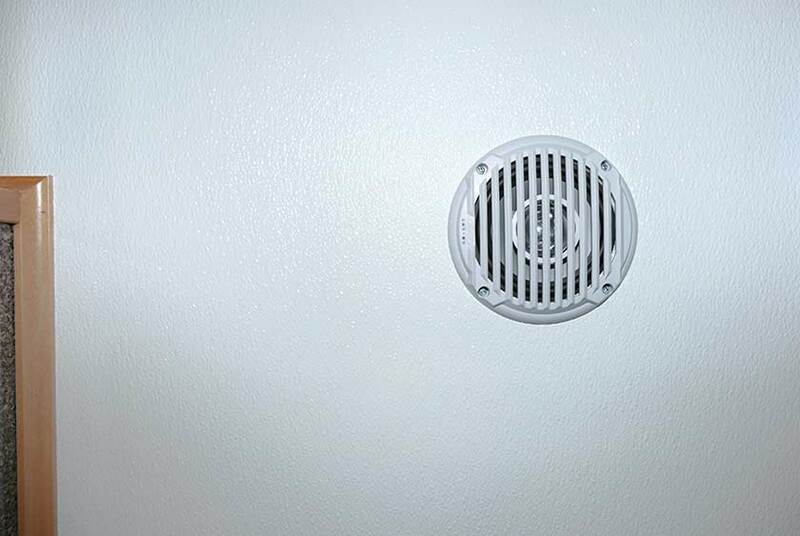 The ceiling installed speakers, and central music system is also available for your guests’ enjoyment. 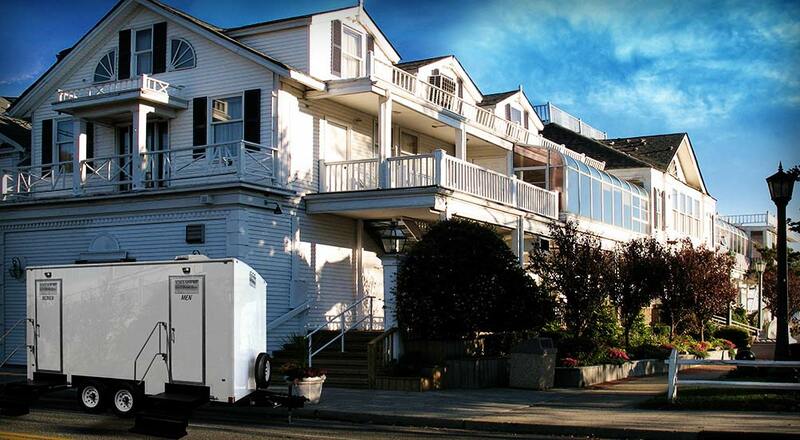 Electricity for the NORTH SHORE luxury restroom trailer operates from a generator or standard 110 Volt outlet. 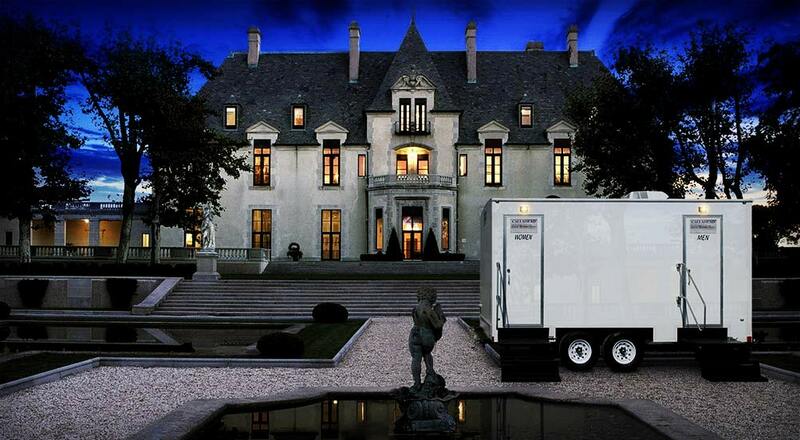 The NORTH SHORE luxury restroom trailer is delivered by a CALLAHEAD professional uniformed specialist. 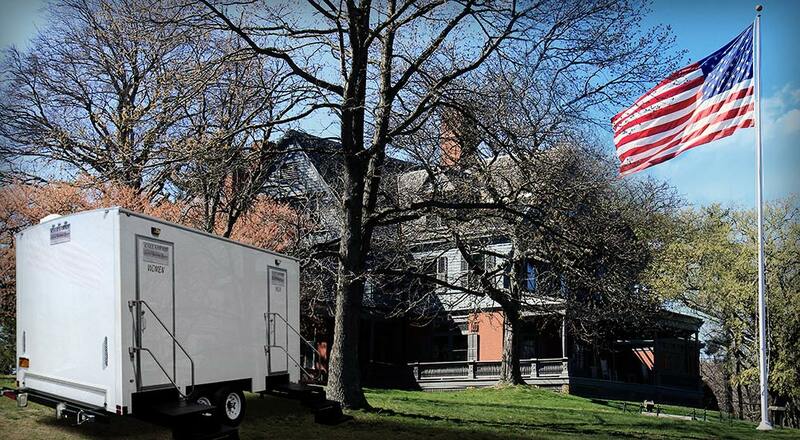 Set up of the restroom trailer will only take approximately 30 minutes until it is ready for use. 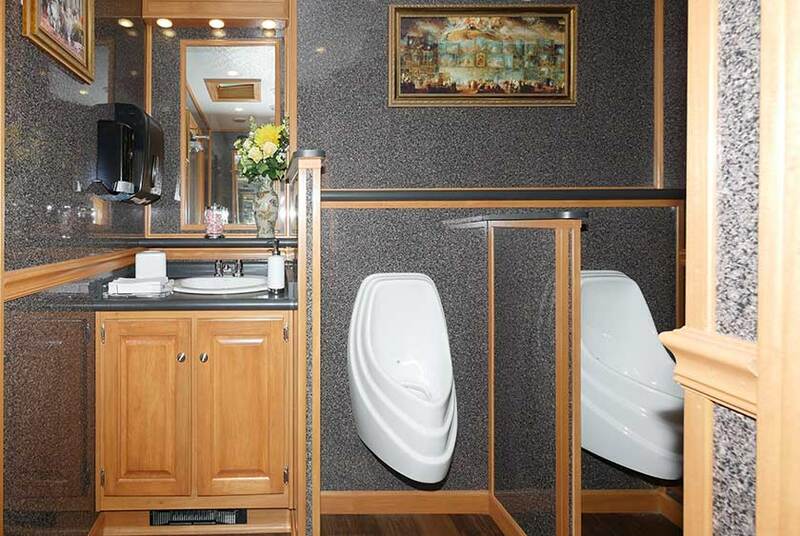 This is a restroom trailer designed to handle use by hundreds of people. 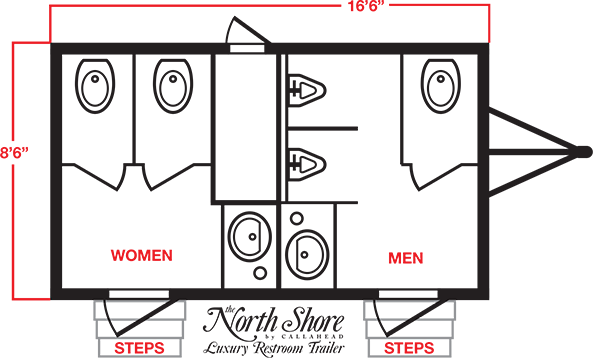 CALLAHEAD uses only hospital grade disinfectants and cleaners, to ensure you are supplying the most sanitary restroom facilities for your guests. CALLAHEAD includes all the luxury amenities with the NORTH SHORE rental just as you would expect from luxury hotels or upscale catering halls. 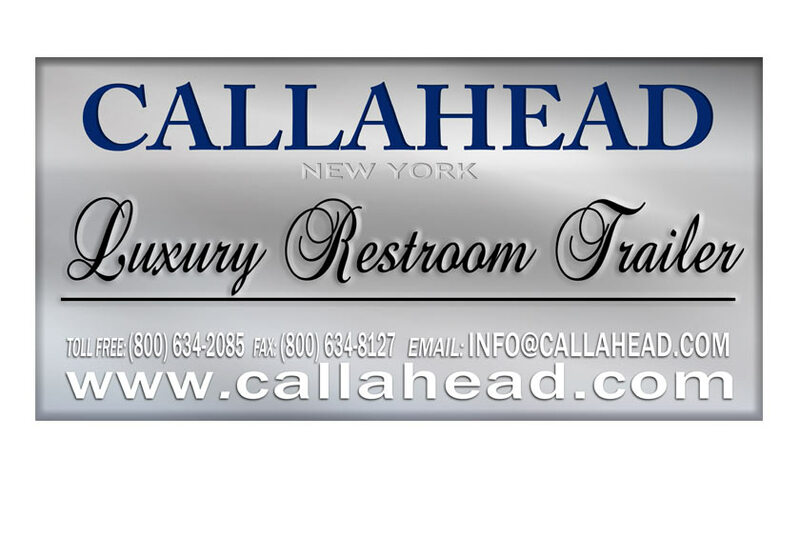 CALLAHEAD even offers the option of a uniformed restroom attendant to keep the NORTH SHORE in perfect condition throughout your entire event. 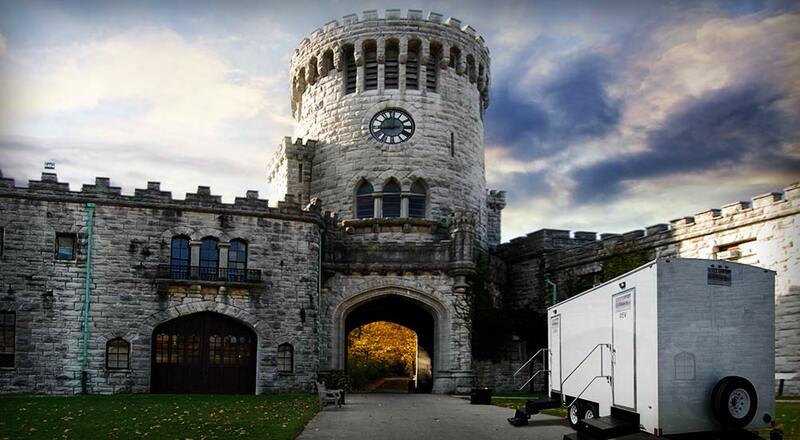 The NORTH SHORE luxury restroom trailer is available for delivery throughout all of New York City’s five boroughs of Brooklyn, Queens, Manhattan, Staten Island and the Bronx, and all of Westchester Nassau and Suffolk Counties. 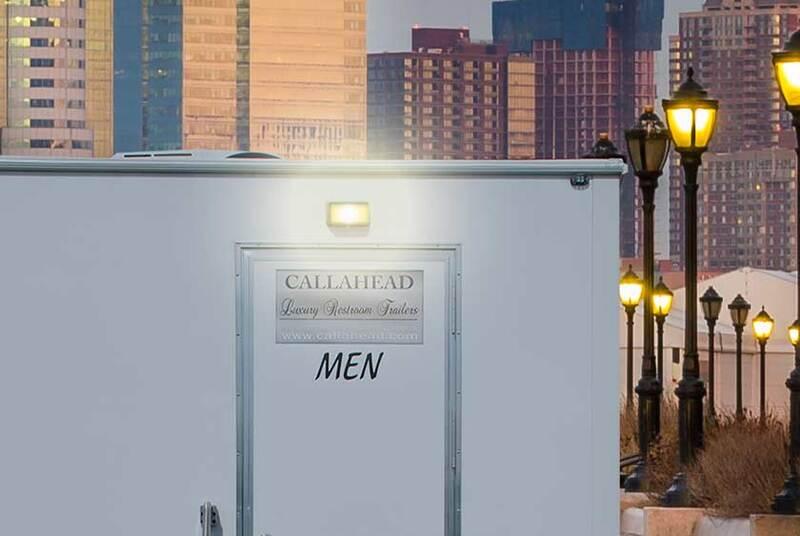 When you want the best for your guests at your next special event, only CALLAHEAD can deliver luxurious and sanitary restroom facilities without the worry. 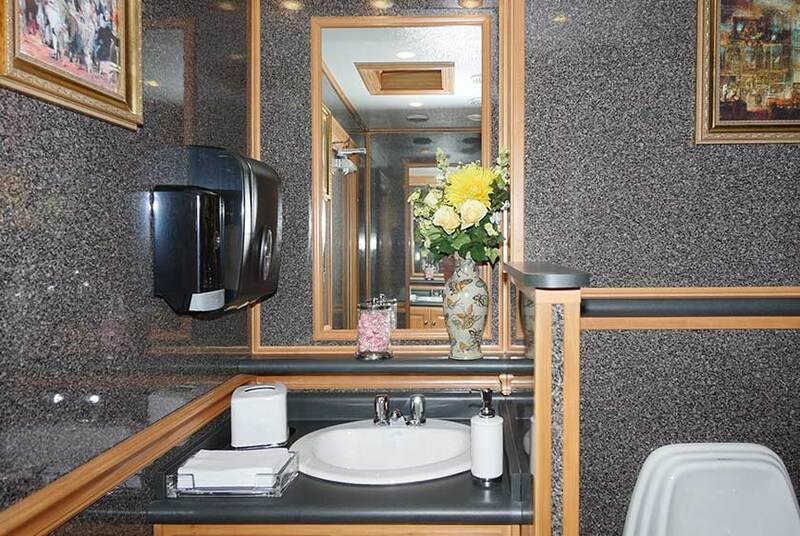 Let our decades of experience and one of a kind restroom facilities bring style and comfort to ensure restrooms are the last thing you will ever have to worry about. 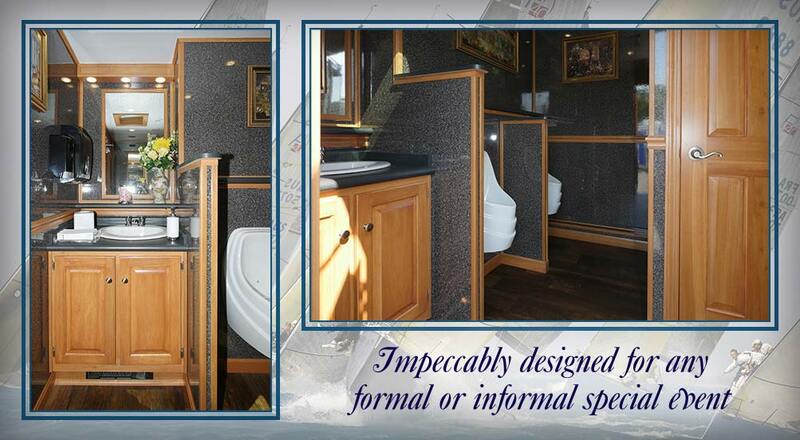 CALLAHEAD’s NORTH SHORE luxury restroom trailer is a 5-station bathroom for short term rental needs. 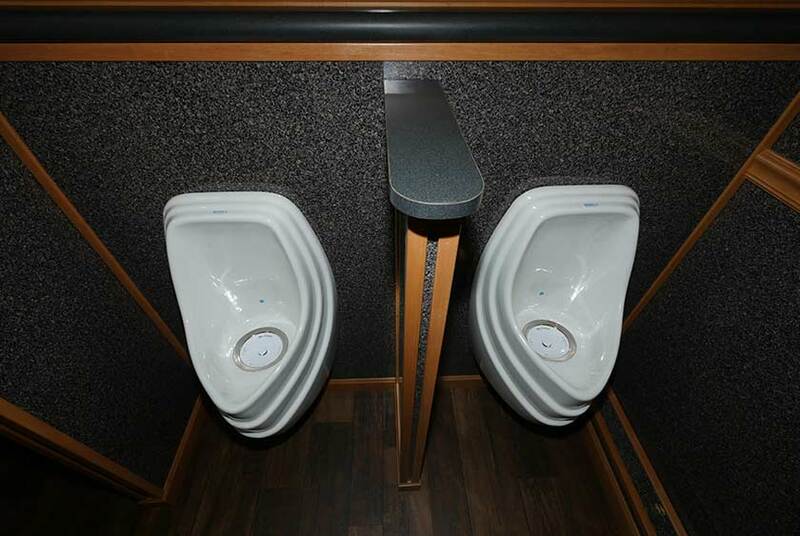 It is perfect for any formal or informal social gathering when you require more than one restroom facility and do not require one of our larger Restroom Trailers NY. 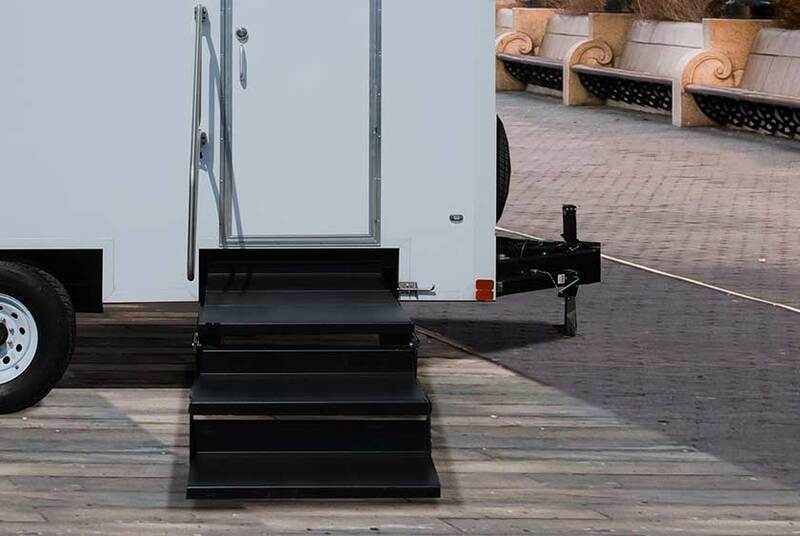 The NORTH SHORE is impeccably designed to provide users with upscale restroom facilities for any special occasion, fundraiser, corporate event, or other social gathering where portable restrooms are needed. Equipped with private bathroom stalls, ornate gold framed artwork, custom floral arrangements, thermostat heat and air conditioning system, surround sound music, and mirrored vanity sinks complete with all the VIP amenities, the NORTH SHORE is sure to impress. 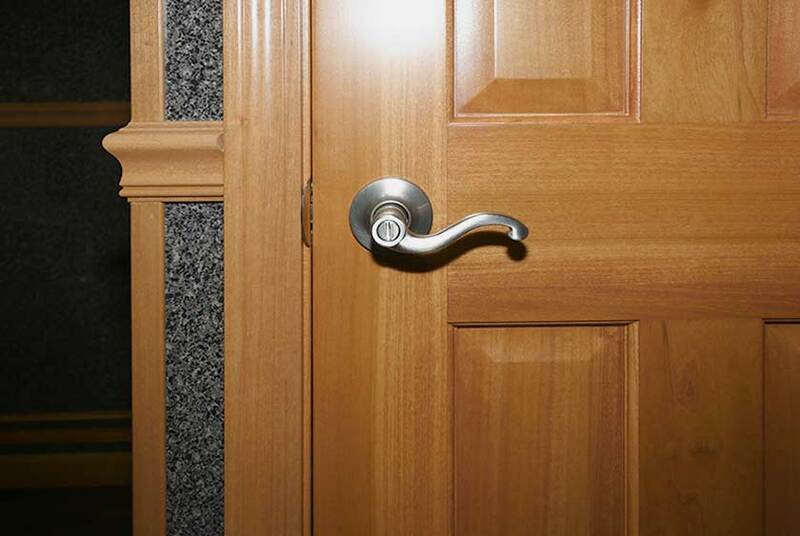 The women’s restroom has two private bathroom stalls with solid wood lockable doors. The men’s restroom has a spacious private bathroom stall and two waterless porcelain urinals with privacy divider. 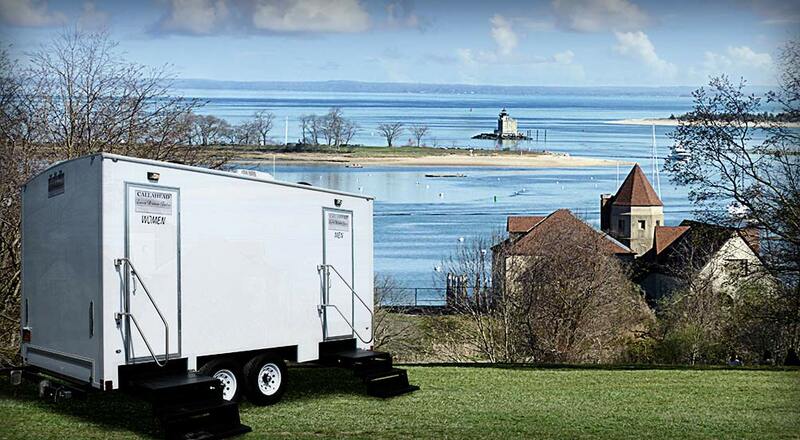 THE NORTH SHORE RESTROOM TRAILER IS READY WHEN YOU ARE!